This Sunday, November 18, is International World Day of Remembrance for Road Traffic Victims. This annual event commemorates the millions of people killed and injured in traffic crashes around the world. 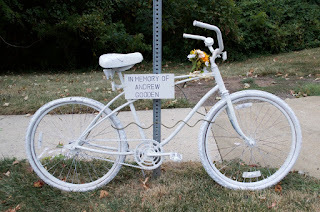 FABB members and anyone else interested in safety for cyclists and pedestrians are invited to join Alexandria Families For Safe Streets for a walk of silence from the beginning of King Street near the Potomac to Market Square to honor those who have been impacted by traffic crashes. The walk will begin at 2 pm and will be followed by a brief ceremony featuring Virginia Delegate Mark Levine, Vice Mayor and Mayor-Elect Justin Wilson, Alexandria Chief of Police Michael Brown, and Director of Transportation & Environmental Services Yon Lambert. Please join AFSS to show your support for traffic crash victims and for additional action in the Virginia General Assembly and in Alexandria to make our streets safer to walk and bike. For more information about this event, please contact Mike Doyle at (703) 946-8401 or mike@alxffss.org.